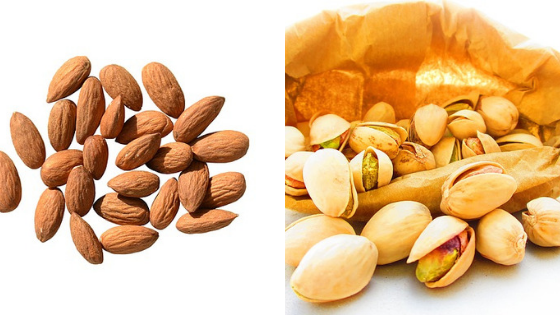 Question: What’s the difference between almonds vs pistachios? Answer: Two of the most widely consumed nuts in the world are almonds and pistachios. While both technically are not nuts in botanical terms, we will refer to them as nuts for the purposes of this article. They are both drupes, but we will save that topic for another article. Below we have outlined some of the key differences and similarities between almonds vs pistachios. There are no significant differences between the nutrition data of almonds vs pistachios. If you are looking for a better option in terms of nutrition, the pistachios are better in terms of calories and total fat. However, given that the main nutrition differences are not significant, we suspect that most people will likely opt for taste over nutrition. Almonds grow on trees that can grow to approximately 35 feet in height. They are native to the Southern Asia and the Middle East. Almond trees thrive in Mediterranean climates that produce temperatures from about 60ºF to 90ºF. In the United States, California produces the vast majority of almonds consumed in the world. It takes about 36 months from planting for the almond tree to produce a harvest. In approximately six years from planting, the almond tree hits its peak of production. The almond tree produces the hulls, shell, and, of course, the edible kernel as well. The picture below shows the hull partially covering the almond shell. Inside the shell is the delicious kernel (not pictured). The pistachio tree is native to Central Asia and the Middle East, but it can be found in places such as the United States, India, and China. 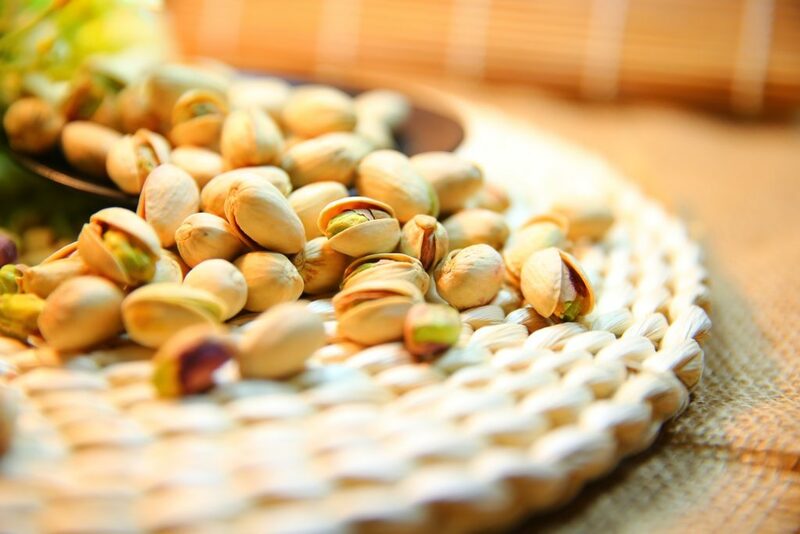 In the United States, a large majority of pistachios are grown in California with other minor players including Arizona and New Mexico. Pistachio trees fair best in hot and dry conditions ranging from temperatures of about 76ºF to 99ºF in the summer. They also require cold winters for dormancy with an average of 900 hours below 45ºF. This dormancy creates a consistent bloom between both the male and female trees. Without this consistency, pollination becomes a problem and, therefore, the crop is not optimal. After the pistachios is first planted, it can take up to 5 years for the first pistachio nut to be produced. However, the pistachio tree can produce a crop for over 100 years from a seedling. The below picture shows pistachios growing on the tree. What is shown is the fleshy outer layer. The shell and nut are housed below the outer layer. Almonds are commonly harvested from early August to late September in the United States. 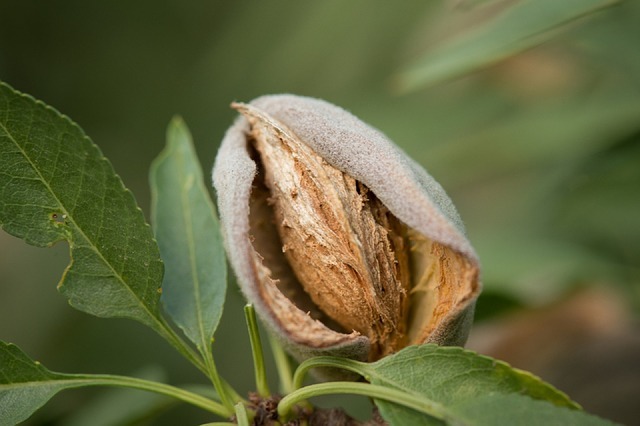 A sign that the almonds are ready to be harvested is when nearly all the hulls of the almonds have split open to expose the shell. The almonds are harvested by knocking them to ground. This is done via a machine that rapidly shakes the tree when done on a large scale. For smaller harvests, a rubber mallet is often used on the tree limbs to free the almonds from the tree. A tarp or similar piece of material is often used to make the collection process easier and cleaner. After the almonds are harvested, the husks are removed and discarded to allow the almonds to dry. Drying is required to deter mold and to improve the taste. 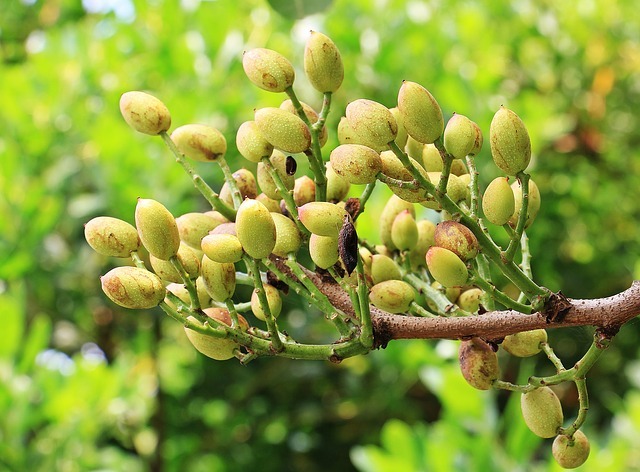 Pistachios, like almonds, are harvested from August to September in most areas where they grow. The time to start thinking of harvesting is when the hulls change from green to a reddish color. After a week or so of being red, the pistachios can be harvested. Pistachios are know for the classic split in their shell, as pictured below. They come off the tree with this split unlike almonds. When the pistachios are knocked off the tree, great care needs to be taken to make sure the exposed nuts are not tainted by the surround environment (i.e. dirt). Similar to almonds, pistachios can be harvested manually using a tarp to catch the nuts and a mallet or pole to knock the nuts onto the tarp. For large commercial collection, shaker machines are used. After harvest, the hulls are quickly removed to maintain the nuts’ flavor and to prevent molding. The pistachios are then dried similarly to almonds.